All boxes in the checklist are required to be checked, including those where no enrolments are recorded. This is to verify that the school records have been interrogated to determine whether or not there are enrolments in all needs categories. Once all relevant sections are completed, including the checklist, select the button Check Census form for completeness. This will check the Census form to ensure all required fields have been filled in. If there are any mandatory fields that have not been completed, a warning message will appear and missing fields will be highlighted in red. Select OK and revisit the Census form to complete all fields that are highlighted in red. The person authorised by the governing body to submit the Census form, is required to declare the data to be a true and correct record and that all appropriate documentation will be retained by the school/governing body for a period of five years from Census Day, and in a way that ensures the integrity and security of the data and documents defined. a link to the Census Feedback web survey. Provide details of the authorised person in the relevant fields. Enter the full name of the authorised person. 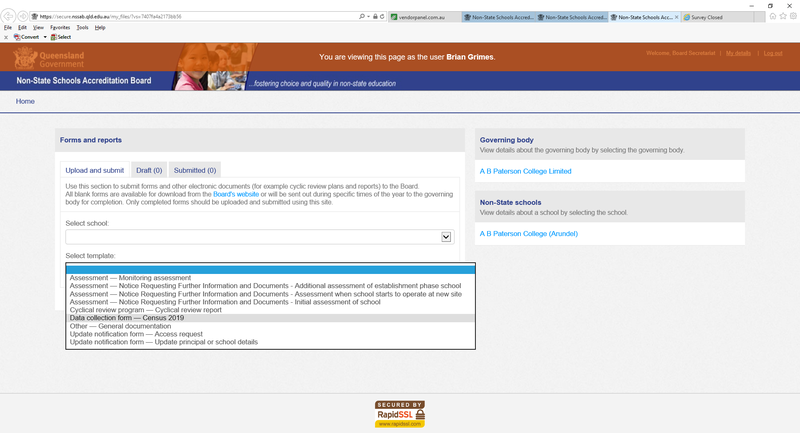 Enter the position of the authorised person in relation to the school or governing body. Enter the telephone number of the authorised person. Enter the number using numerical characters only, for example, enter (07) 1111 2222 as 0711112222. Enter the date the authorisation and declaration is made. The calendar is activated by clicking the drop-down menu that appears once the date field is selected. Use the calendar to ensure that the date is in the correct format (dd/mm/yyyy). Tick the three boxes indicating agreement with the statements. Once the Census form is complete and all data has been checked and authorised, select the button Save Census form at the bottom of the Census form and submit via NSSAB Online Services. If unable to use the button, the Census form can also be saved via the (Ctrl+S) function of Adobe Reader. The Board is continually looking for ways to improve the administration and collection of the data in this Census. Please complete the Census Feedback Survey by clicking the link on the form. If the Census form is submitted via NSSAB Online Services, a link to the Census Feedback Survey is also available there. All responses are anonymous. Read the instructions for submission carefully. The Census form has to be submitted by the person authorised by the governing body (the ‘Authorised person’) to submit school Census data on behalf of the governing body. Contact the governing body to find out who can authorise and submit the Census form. Also refer to Arrangements for schools under certain governing bodies. Refer to the diagram on the following page to establish the path needed to submit the Census form to the NSSAB Secretariat. 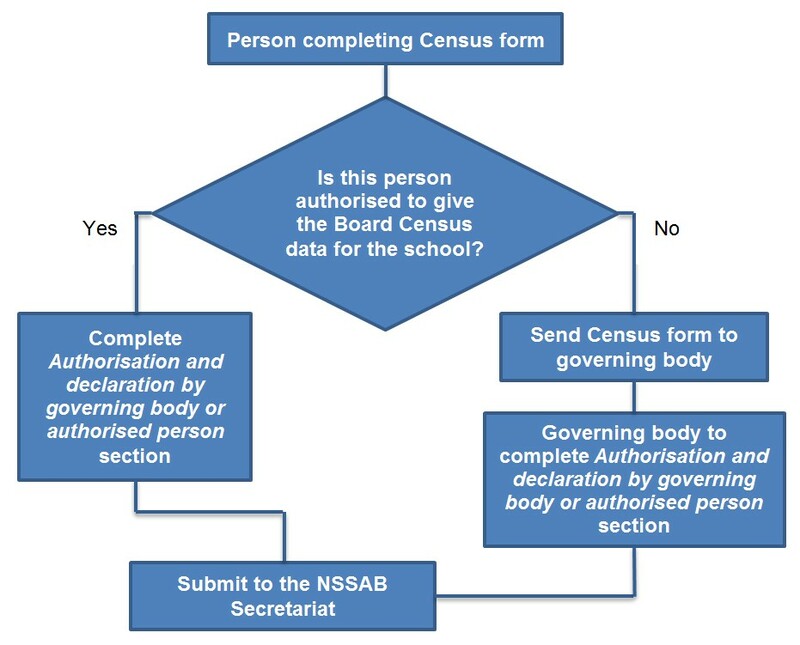 If a person at the school is the authorised person, ensure that person checks the data and completes the section Authorisation and declaration by governing body or authorised person before submitting the Census form via NSSAB Online Services. Otherwise email the form to the governing body for authorisation and submission. The Roman Catholic Trust Corporation for the Diocese of Townsville: Send to Townsville Catholic Education Office, c/- Mr Chris Watts at cwatts2@tsv.catholic.edu.au. All other schools should contact their governing body to find out if an individual at the school/site has been authorised to submit the Census form on behalf of the governing body. 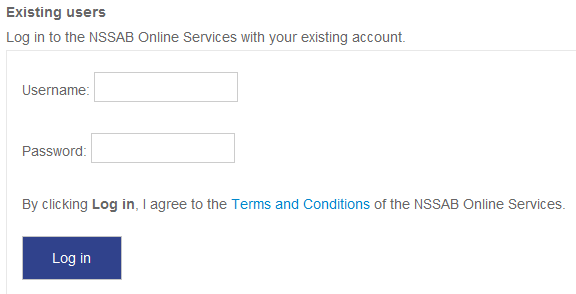 Log in to NSSAB Online Services via https://secure.nssab.qld.edu.au/nos.php. Create a new submission from the Upload and submit tab by selecting Data collection form – Census 2019 from the drop-down menu. Attach the Census form(s) to the submission using the grey Attach file button. This will display a new screen. Use the Add files button to browse to the Census form(s) on the computer. Note: A school or governing body can attach multiple Census forms to the one submission for several sites or modes of delivery. Select the file(s) for upload. Multiple files can be selected by holding down the Shift key while clicking the required files. Click Open. Once displayed, click Upload files. 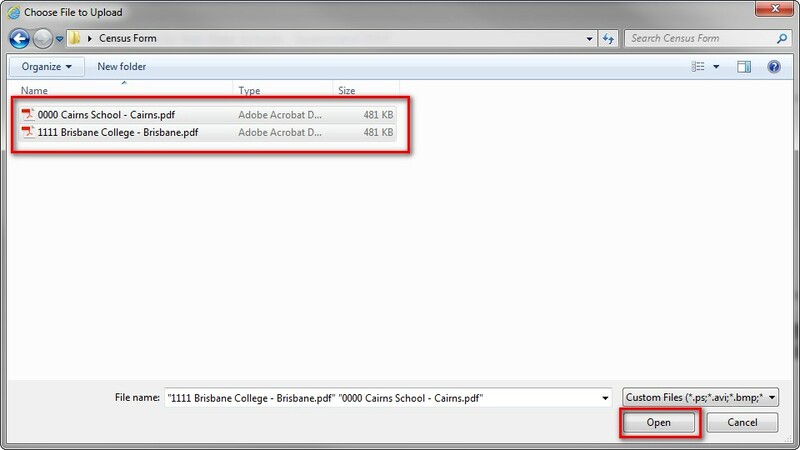 Once a file is attached it will display in the right-hand column under Files attached. Select the Submit button on the left-hand side to send it to the Board. 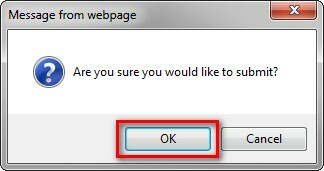 Select OK to finalise the submission. The submission should now appear under the Submitted tab.